I read this on Rayovac’s Facebook Page. October is Fire Prevention Month! 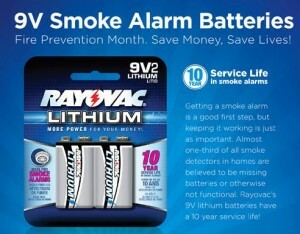 We want to make sure your family stays safe by offering coupons for FREE 9V batteries to change out in your smoke alarms. Stay tuned for more information, they will go fast! Become a Rayovac Facebook fan now. That way when this offer goes live you’ll be ready to score some FREE Batteries.